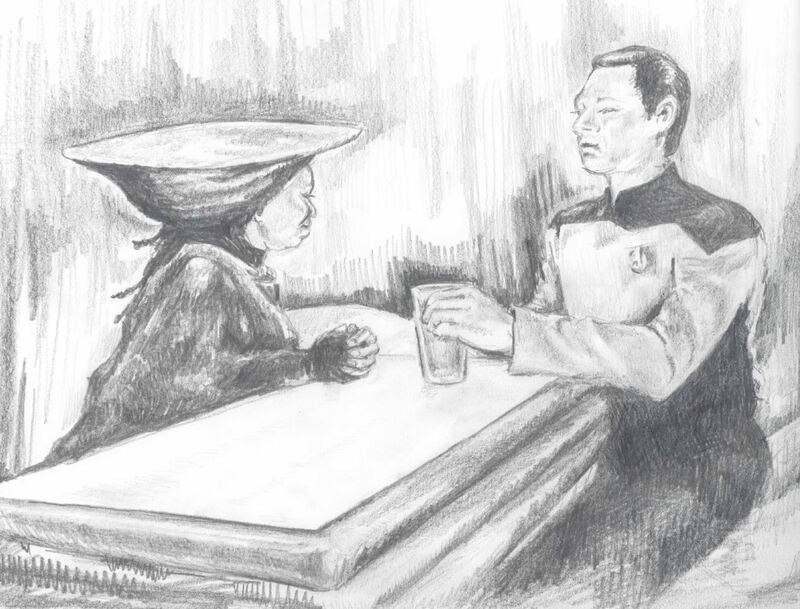 GUINAN: Hello, Data. Would you like to try something new? It’s a concoction I heard about on Prakal II. I think it’s wonderful but I need a second opinion. DATA: Eighty-seven percent Saurian Brandy. Targ milk and Danisian mead comprise the rest. There is an unusually high concentration of fructose compounds and monosaccharaides. Now, I’ve heard of “supertasters” before, but to be able to pick out that a beverage has both targ milk and Danisian mead? That’s what I call a supertaster! Tomfoolery aside, we can actually learn a thing or two about how to be a good beer judge from Data, the most super-est of hypothetical supertasters. For example, did you notice how Data was only listing the constituent parts of the beverage but not making any statements regarding his personal taste? Well, Data being the non-human, non-emotional android that he is doesn’t need food to survive, but more importantly he can neither like nor dislike anything. He can only analyze food, but not technically enjoy it. In other words, even though Data possesses a sense of taste, perhaps a sense of taste far superior to any human, he does not express any personal taste. When we talk about “taste”, we should distinguish between “personal taste” and the physiological “sense of taste”. Personal taste refers to someone’s private criteria for liking or disliking something, whereas the sense of taste refers to one’s ability to identify features of an object using the tongue in conjunction with smell and the trigeminal nerve which is the nerve responsible for providing sensory impressions of texture (mouthfeel) and temperature. This is important because beer judges in the U.S. take a more objective approach when evaluating a beer by focusing on judging beer according to a uniform set of predetermined beer style definitions, and not judging according to “personal taste” (like or dislike), which should be kept to a minimum. One must have experience with a range of foods and other relevant sense-data memories coupled with the ability to recall those experiences for comparative or identifying purposes. Case in point, Data would not have been able to identify Saurian Brandy, targ milk, and Danisian mead had he not already had sufficient knowledge and/or experience of them and had the ability to recall those experiences. When it comes to beer, it’s important that the judge has carefully tasted at least a few excellent examples of the style of beer he/she is judging, and, equally important, understands what criteria needs to be met in order to qualify a given sample of beer as a “good” (or poor) example of the style it’s claimed to be. This experiential condition suggests that “tasting” is a learned ability, which implies that one can learn to be a “supertaster”. Well, sort of. Remember, I’m trying to convince you that you don’t have to be a supertaster to be a good beer judge. In order to do that, we’re going to have to talk a little bit about what a supertaster is (and what it’s not), and also how being a supertaster could be considered a disadvantage when it comes to judging beer. The term “supertaster” originally appeared in print in the early 1990s in an article by experimental psychologist Linda Bartoshuk in the trade journal Food Technology. Basically, the term “supertaster” was used to describe a specific subset of people in an experiment who perceived a compound called 6-n-propylthiouracil (PROP) to be intensely bitter (relative to salt) while others did not. They had comparatively more fungiform papillae (the little bumps that house the taste buds) on the anterior tongue (the front two-thirds of the tongue). In other words, according to the original definition, if you perceive PROP to be intensely bitter, then you’re a supertaster. Those who perceived PROP as bitter, but not intensely bitter are called medium tasters (normal tasters), and those who did not perceive PROP to be bitter at all are called non-tasters. But it’s not just that supertasters perceive flavors more intensely. Further experiments showed that supertasters also display greater chemosensory acuity, meaning that supertasters are able to detect smaller variations in ingredient levels. With all of these enhanced tasting abilities, why wouldn’t a supertaster be the perfect beer judge, or any other type of food judge for that matter? Speaking of bitterness, if you look at what flavors supertasters are said to be able to perceive more intensely than other people, it’s particularly bitterness and sweetness. Although bitterness and sweetness are important components in virtually all styles of beer, there are clearly a variety of other flavors found in beer. And even though the kind of supertasters we’ve discussed thus far (PROP-sensitive supertasters) are hypersensitive to bitterness and sweetness, it’s not clear how intensely (or not) such supertasters interpret other tastes like sourness, saltiness, and umami, which may lead to misjudging all of the other flavor components in a given beer, especially when describing the balance of those flavors. So it’s not just that supertasters might over exaggerate the amount of bitterness in a beer, they might also potentially downplay the level of say sourness in a Lambic or Berliner Weisse, taking points off for the beer lacking the requisite level of sourness and so forth. Now, if the supertaster phenomenon only affected a very small percentage of the population, we probably wouldn’t be talking about any of this with respect to judging beer. However, most estimates suggest that 25% of the population are supertasters, which might cause some worry on the scoresheets for those brewers who just happen to have a couple of supertasters judging their beer. But before we hit the panic button and question the validity of the whole enterprise of beer judging itself including any beer ribbons or medals awarded, let’s clear up one little ambiguity about supertasters. Who You Callin’ a Supertaster?!? To be fair, it’s misleading to think of a supertaster as someone who has a superior sense of taste if by superior we mean something like “refined” or “exceptionally accurate” as was implied when suggesting that Data is a supertaster in the example above. The “super” in supertaster denotes someone who perceives certain tastes more intensely than others, sometimes unpleasantly so, which presents the kind of problems we’ve been discussing with respect to supertasters not being good (accurate) beer judges. So even though we may think of someone like Data who has a super (exceptionally accurate) sense of taste to be a supertaster, this is not the same as someone who we would consider to be a supertaster as the word is largely intended. And since the supertaster phenomenon seems to very closely correspond to the presence of at least one particular gene (TAS2R38), if it is purely genetic, in a strict sense you can’t really learn to be a supertaster. However, as I and others maintain, supertaster or not, you can learn to develop and refine your pallet to become an exceptionally accurate beer judge… Perhaps even a super-judge. But going back to the original premise of this article [you don’t have to be a supertaster to be a good beer judge], you can now see how it’s actually pretty easy to make a case against supertasters being good beer judges assuming we’re on the same page about what a supertaster is. And even if we throw in that extra feature regarding a supertaster’s general ability to detect smaller variations in ingredient levels in food, it still doesn’t change the fact that the defining feature of supertasters is that they perceive certain flavors more intensely than others which may also potentially include other tastes besides bitterness and sweetness, which means all the previously mentioned critiques against supertasters being good (accurate) beer judges remain. Of course if the purpose of a certain beer experiment is to determine if there is a detectable difference between two beer samples, then a supertaster would likely have a distinct advantage. Not only that, in such experiments, if the detection threshold of the subjects had not been assessed, then the resulting data could very well be skewed, which is why most oral chemosensation [taste] experiments include as part of their design a method for identifying and accounting for non-tasters, medium tasters, and supertasters (or some other similar classification). Again, this doesn’t affect beer competitions as much because those beers are judged individually with respect to specific style guidelines. But even though the sole purpose of a beer judging competition isn’t to detect minute differences in two beer samples, we’re still left with the sticky question of whether or not unidentified supertasters who perceive some tastes more intensely are negatively impacting the reliability of beer judging as a whole. So let’s talk briefly about how beer competitions work starting with homebrew competitions, then commercial beer.